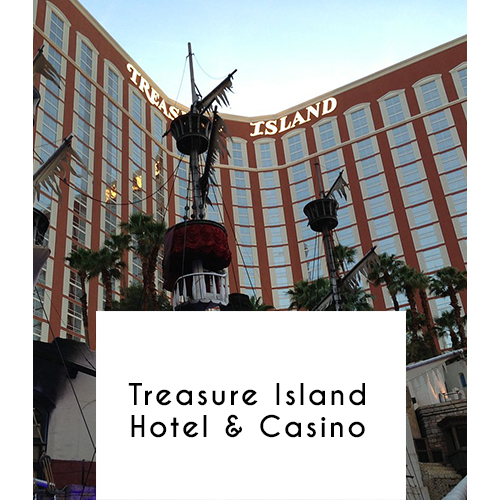 / Treasure Island Hotel & Casino, Las Vegas, Nevada. Treasure Island Hotel & Casino, Las Vegas, Nevada. Connected to the Fashion Show Mall by a pedestrian bridge, this lively casino hotel is across the Strip from The Palazzo. Modern, sophisticated rooms have floor-to-ceiling windows (some overlooking the Strip), WiFi, flat-screens, living areas and marble-floored bathrooms; suites add whirlpool tubs and minifridges. In addition to the casino, amenities include festive bars, a busy nightclub, an outdoor pool and hot tub, a fitness center, a full-service spa and live shows. There are also several restaurants, including an upscale steakhouse, a casual BBQ joint and a pizzeria.